Learn about this revolutionary approach to proper running and walking that helps develop safe and effective life-long fitness programs. This seminar is FREE and located in the Scheels Training Rooms. The first 30 attendees will receive a $10 Scheels Gift Card. 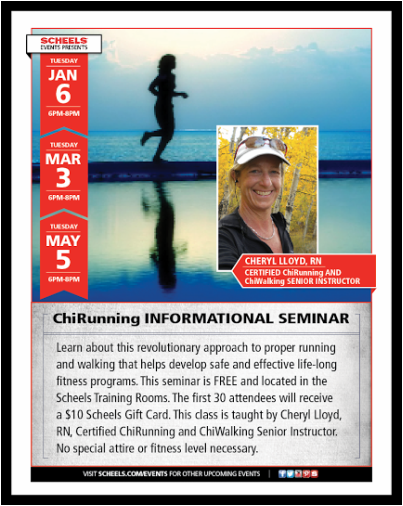 This class is taught by Cheryl Lloyd, RN, Certified ChiRunning and ChiWalking Senior Instructor. No special attire or fitness level necessary.